Aus den Schlagzeilen ist uns Pakistan bekannt als ein Land, wo politisches Chaos Alltag ist, wo Terroristen – zumindest eine Weile lang – untertauchen können und wo Geschlechtergleichstellung ein ferner Traum ist. Gibt es Hoffnung auf Besserung? Wir machen uns auf die Suche. To hear Pakistan described as a “land of opportunity” may come as a surprise to some. Since the British left India in 1947 and partitionteilenpartitioned the country, India and Pakistan have struggled to recover from the terrible violence and population transfers that to ensuefolgenensued: a million people died and 15 million were displacedheimatvertriebendisplaced. Since then, Pakistan has rarely appeared in the media in a positive light. The constant negative depictionDarstellungdepiction of the country is something that Khan, who has spent 11 years in Britain as an entrepreneur, is pushing back against. “Pakistan is not the way it is shown on CNN, the BBC or any other media,” he says. The media reports are often on Pakistan’s religious extremism and its patriarchal society; notorious, too, was its role as the country where Osama bin Laden took refuge before he was killed in Abbottabad in 2011 by US troops. Khan doesn’t deny that the country has challenges. He does, however, insist that his country is by no means a lost cause. Khan is eager to highlight that there is another Pakistan. He says that we just need to make the effort to find it. Perhaps Ramsha Jahangir stands for this other Pakistan. Initially, the young journalist from Karachi found it difficult to persuade even members of her own family that she ought to do the nightshift at Dawn. 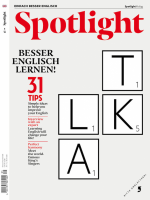 The daily broadsheetgroßformatige Zeitungbroadsheet published in English is the oldest and most popular English-language paper in the country. Dawn has a high percentage of female employees. Jahangir puts this down to the fact that they hold positions of power there: of the 12 top editorial positions, four are held by women. Jahangir says that internet access has had a big impact on society in Pakistan: people under 25 (she is 24) make up 63 per cent of the population, with huge numbers of them adepterfahren, geschicktadept at using new technology and social media. Jahangir writes about culture, and she’s convinced that Pakistan is making something of a cultural comeback, too, especially with the revival of the film industry. In 2016, documentary film-maker Sharmeen Obaid-Chinoy became the first Pakistani to win two Oscars. Partition: 1947, the British partitioned India, creating the new nation states of India and Pakistan. Migration: The partition caused millions of Muslims to head to Pakistan and millions of Hindus and Sikhs to settle in India. Religion: Pakistan became a Muslim-majority nation. Kashmir: Both countries have claimed the Kashmir border region since the partition, and have been fighting over it off and onimmer mal wiederoff and on since that time. Movies are a beloved pastime for people in Pakistan’s big cities, part of a lifestyle that sounds in some ways similar to that in Europe or America. Families like to shop at the local mall before heading off to a favourite pizzeria, for example. The evening out might also include a trip to the cinema to take in the latest Pakistani film or to see one of the popular Bollywood films, many of which feature Pakistani actors. Pakistan’s many food cultures are in the spotlight, too, says Jahangir: city food festivals are on the rise, and chefs across the country are having fun experimenting with traditional dishes. The ever-­popular samosa — a triangle of pastryTeig, Pastetepastry filled with spiced vegetables or meat — has recently been to reworkhier: neu entwickelnreworked as a dessert filled with chocolate or fruit. While there is resistance in Pakistani society to female chefs in restaurants, Jahangir points out that they are well represented at food festivals and on TV cooking shows. While film and TV are much-loved in Pakistan, other modern forms of the visual arts, such as painting and photography, are only slowly being given their to give its duebeachtet werdendue. Karachi-born artist and academic Huma Mulji says that, compared to 20 years ago, attitudes have at least become “more relaxed”. At home in both Pakistan and the UK, Mulji recently finished a three-week residency in Khushaab, a city in northern Punjab, where she was creating a new body of photographic work for an upcomingbevorstehendupcoming exhibition. She is fascinated by issues of time, place and identity. Her piece Arabian Delight from 2008 examined what she calls the “notionGedanke, Vorstellungnotion of the ‘Arabization’ of Pakistan”. The exhibition looked at the “re-identification” of Pakistan as a Muslim country at the expense of “its broader South Asian identity”. ­Independence at the end of British colonial rule, explains Mulji, failed to “make up for the trauma of partition from India”. This still presents a challenge to the country’s identity, blightverderben, zerstörenblighting its relationship to India. Pakistan has been hurt by generations of corrupt and ineptunfähiginept politicians, military interference and religious radicalism. The ongoingfortlaufend, andauerndongoing conflict with India is damaging, both economically and culturally. With a nationalist government in India and an overbearingallzu dominierendoverbearing Pakistani military, a thawAuftauenthaw in the relationship seems unlikely. The nuclear powers seem determined to to antagonizesich bekämpfenantagonize each other. As a 2018 Human Rights Watch report notes: “Security forces remained unaccountable for human rights violations and exercised disproportionate political influence over civilian authorities.” Violence from Islamist militants decreased in 2017, though “scores ofzahlreichescores of people were [still] killed in attacks”. The government continues to suppressunterdrückensuppress “dissentingwidersprechenddissenting voices” from NGO (non-governmental organization)nicht staatliche OrganisationNGOs and the media. The election on 15 July should see an unprecedentedbeispiellosunprecedented number of young people vote, but few people expect genuine change. The contradictionWiderspruchcontradiction at the heart of Pakistani society can be seen in the case of Marshal Khan, a university student who was lynched by fellow students in 2017 after being accused of blasphemy. The murder was captured on video and shown round the world. It was also widely to condemnverurteilencondemned by Muslim clericGeistlicherclerics. Another example is that of schoolgirl Malala Yousafzai, who was shot by the Taliban in 2012 for her outspokenoffen, geradeherausoutspoken views on women’s right to an education. After multiple operations in the UK, she went on to win a Nobel Peace Prize and is now an internationally known human rights activist. Pakistan is a developing country and 29.5 per cent of its population of 205 million live below the poverty line. A 2017 World Bank report noted that infant: ~ and under-five mortalitySterblichkeit von Kindern unter fünf Jahreninfant and under-five mortality rates are high. In addition: “gender disparityGeschlechterungleichheitGender disparities to persistbestehen, andauernpersist in education, health and all economic sectors. Pakistan has one of the lowest female labour force participa­tion rateErwerbsquotelabour force participation rates in the region.” The report also noted that spending in Pakistan on health, nutrition and education is much lower than in most other countries, “now totalling three per cent of GDP”. Religions: 96.4 per cent Muslim; the rest are Hindu, Christian and other. However, not all the news is bad: Pakistan’s economic growth in 2017 is expected to be 5.2 per cent, its highest rate in nine years; poverty declined significantly from 2002 to 2014. Pakistan’s relationship with China is set to to boostankurbelnboost its economy: the China-Pakistan Economic Corridor (CPEC) is a development project with plans to invest up to $62 billion in modernizing electricity supplyStromversorgungelectricity supplies, roads, railways and more. Also, the number of Pakistanis using the internet reached 34.3 million in 2016. For journalist Jahangir, this is key to change. In the manner of #MeToo, “thousands of women in Pakistan now feel comfortable telling their stories”, she says, some openly on Facebook, others on closed social media platforms. If Pakistan is to become a “land of opportunity”, it has much to do. The country could become attractive to international tourists, with its traditional foods, dress and customs. As it stands, tourists from all over Pakistan visit the north of the country, travelling to places like the mountains of the Swat District, known as the “Switzerland of Pakistan”, the Hunza Valley, home to lovely Lake Attabad, and heritage siteKulturerbestätteheritage sites such as the Badshahi Mosque in Lahore and the restored Mughal-era Saidpur village, near the capital of Islamabad. Feminism is growing, and a lot of women are finding a voice on social media, and using such platforms to share experiences, problems and find employment opportunities. From a Western perspective, the challenges facing Pakistan can seem insurmountableunüberwindbarinsurmountable. That said, many young people in this diversediversediverse country are not willing to accept the status quo. It will require energy and determination to push the country forward. In the eyes of some, this could be a chance for women to find a new role. Lahore-based Maria Umar would agree. She began her working life as a teacher, but when her application for maternity leaveMutterschutzurlaub, Erziehungsurlaubmaternity leave was refused, she started looking for work she could do from home. In 2010, she created the Women’s Digital League. The business has offices in Karachi, Lahore and Peshawar, and has trained hundreds of women in rural Pakistan to do micro-tasks online, including ghostwriting and social media management.